It is important to find a walking aid that suits your particular needs. We have a number of three wheeled tri-walkers and four wheeled rollators to choose from, some which are very lightweight and double up as a seat. Below are details of just some of the products available in the shop. We also stock indoor walking frames and accessories. Some of these items are available for hire. This ultimate in 3-Leg walkers is not only lightweight, but has a built-in rest seat, plus it folds and locks together for easy storage. 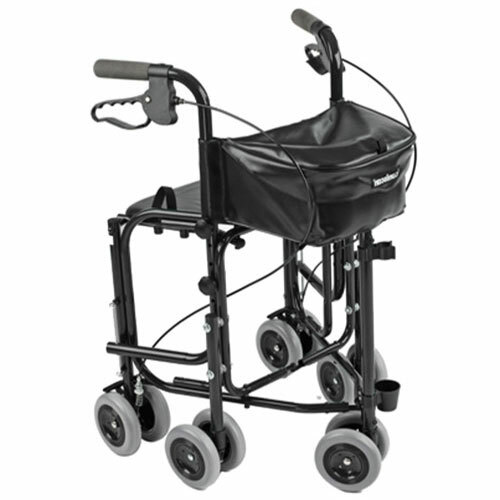 This steel tri-walker with bag features a durable, steel frame which is easy to manoeuvre. It has arthritic friendly looped cable brakes and adjustable handle height to enable the best posture when in use. 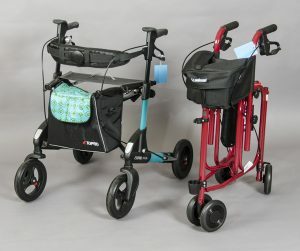 It is our lowest priced tri-walker and is available in either red or blue. The tri-walker with seat provides a useful solution, enabling users to rest when needed. With a robust steel frame, it offers both stability and portability to the user, and is suitable for indoor and outdoor use. It also has handy size pockets for carrying essentials. Developed to be very lightweight at only 7kg, this rollator is easy to manoeuvre and features an easy folding mechanism for storage and transportation. The handles can be adjusted in height to suit user requirements and are anatomically designed for a comfortable grip. The padded seat flips up easily for access to the storage bag and a curved, padded backrest adds to the comfort level when seated. It is available in either blue or red finish. The Genesis is a stylish and robust dual folding rollator which folds to an incredibly compact size making it ideal for transportation and storage where space is limited. Features include an easy push button fold mechanism, ergonomic non-slip, height adjustable handles, safety clasp when folded, kerb steppers, large zipped removable bag with shoulder strap and a cane holder that fits both single and tri based sticks (a great new feature not usually available on rollators). The Glider Plus adjustable, as all Uniscan products is made to order (although we do keep some styles and sizes in stock). Not only can the seat height be specified, but also the width and colour. 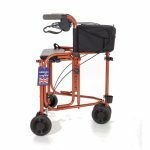 This premium rollator can be purchased in either small or medium sizes and a variety of colours. The Dietz Taima rollator is one of our more lightweight options and is can be purchased in either small or medium sizes.